Increase Safety Awareness & Compliance by Establishing a Safety Culture! Numerous companies in the mining industry are realizing the impact of offering safety incentives on the cost of insurance premiums and overall profitability. By providing safety awards to workers who complete safety training and reach safety milestones, mining companies are able to increase safety compliance and awareness on the jobsite. Miners work in dangerous jobsite environments every day and the potential for injury not only results in multiple expenses for mining companies but can also cost a person his or her life. 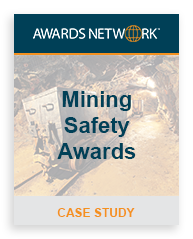 Awards Network works with mining companies to create a safety program that improves safety awareness and compliance while reducing the cost of insurance and worker’s compensation claims. A client in the mining industry found that each on the job accident cost around $50,000 due to lost time and productivity. In order to reduce the number of accidents, the company decided to start a safety point certificate program. Awards Network designed custom point certificates that could be given to employees for on the spot safety recognition. Employees could save the safety point certificates or spend the points on safety awards by mailing the certificates in or redeeming them online. To supplement the safety point certificates, the incentive program included safety posters that gave pointers on safe work behavior and were posted in employee locker rooms and break rooms. The company regularly held safety discussions in which employees could volunteer to lead a discussion on a safety topic of their choice. Volunteers were then awarded safety point certificates based on the quality of the presentation. As a result of the safety point certificate program over two years, lost time accidents were reduced by 47% over the previous years. The estimated cost reduction was $5 million for lost time accidents alone. Overall, the company saw a decrease in employee absenteeism and a favorable increase in productivity and profitability due to the increased safety awareness among employees.